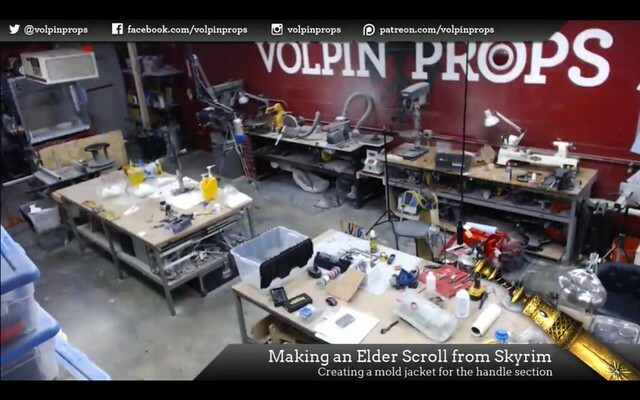 Volpin Props | So You Want to Livestream From a Workshop? 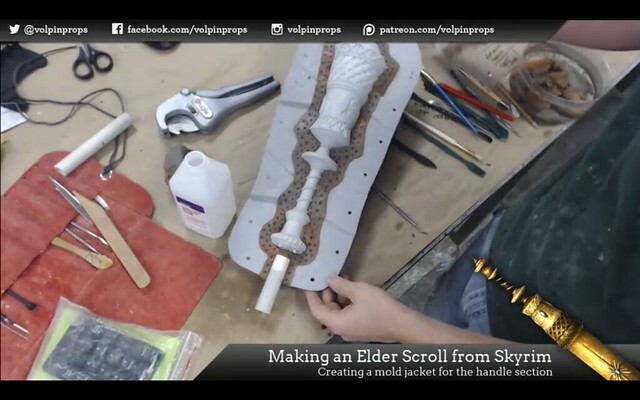 So You Want to Livestream From a Workshop? Full disclosure: There’s a lot of Amazon affiliate links in here. I get asked this question very frequently on my Twitch streams, so it’s time for me to put this info down in one easy to reference location. Some of the following links might toss a few pennies my way if you decide to buy some of the equipment, but I won’t endorse garbage just to make ten cents. I use this stuff in my shop! My shop is nearly 80 feet long and 20 feet wide. Large motors that run equipment create lots of EM interference and can disrupt wireless connections. I needed to run a minimum of four cameras, but as these would be subject to dust and chemicals, running multiple $300+ cameras with a capture card was out of the question. They’d be destroyed in a week and I don’t have the budget for replacements. There are many times when I can’t interact directly with switching equipment, due to my hands being covered in resin or paint, so a dedicated control board was also out. Starting out, I used a control program that was a staple of the streaming community: OBS. This worked for a while but I would experience periodic crashes. Tracking the source of the issues led to a lot of my eventual solutions, but I never found OBS or the newer OBS Studio to be very stable or reliable for my needs. It really didn’t seem to like running webcams on 50′ cables, regardless of my hardware upgrades. Last December I made the switch to Gameshow, which improved both functionality as well as reliability. To date I still have issues broadcasting anything higher than 720 streams, but I believe that’s the fault of my ISP more than the program. Gameshow allows in-program text changes, much easier layer set up, and far more stream options than I’ll ever utilize. 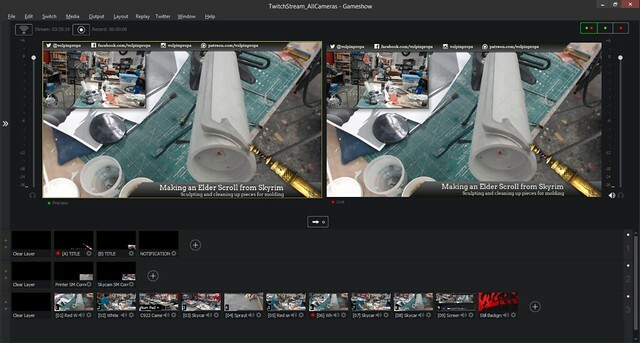 OBS also hated my Logitech 270 camera, situated on my spraybooth, and would crash if this device was even plugged into the computer. No such issues with Gameshow. At $30 or so, it’s worth every penny. 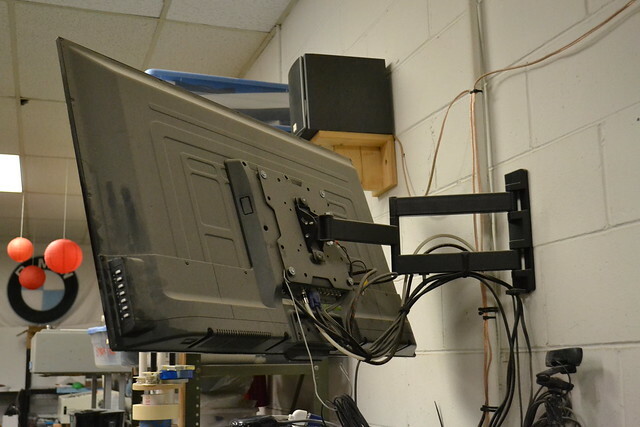 My workshop computer was built to handle 3D Rendering so it’s quite robust in processing speed and memory, but it lacked the resources to control multiple cameras simultaneously. After suffering numerous bluescreens, the problem was diagnosed as insufficient USB voltage across the huge cables I was using in the workshop. 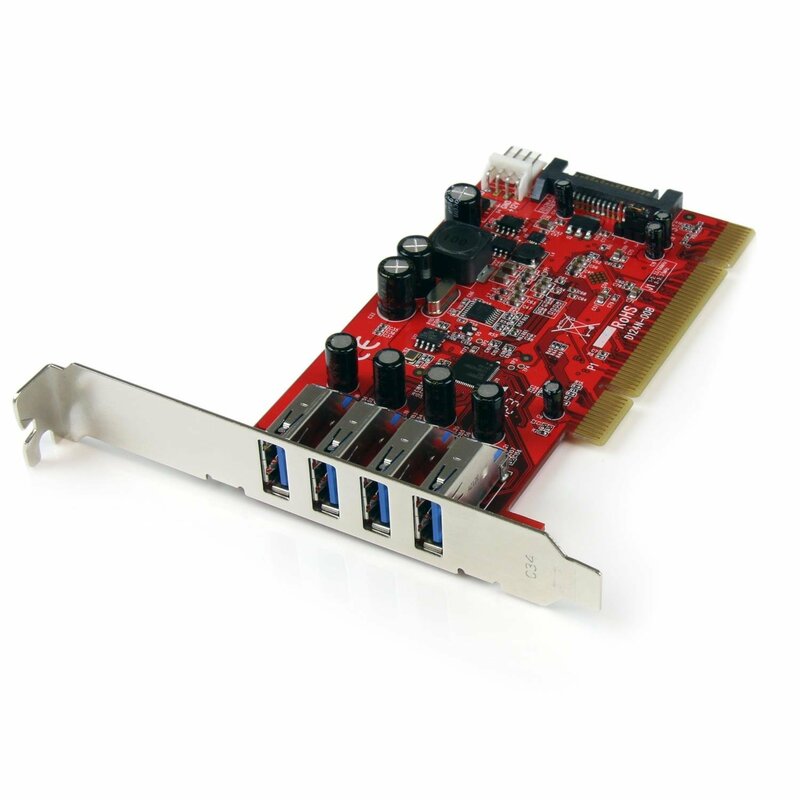 A new USB controller card with direct power supply connection solved this issue. I also added a set of panel mount USB 3.0 ports to the front of my computer case, for running a dedicated microphone. Since my workshop is around 80 feet from end to end, I needed super long USB cables to cover the distance. Most people I spoke with said this would be problematic, since USB devices lose a lot of voltage over long cables. My first set didn’t fit the bill and caused more bluescreens, but switching to a set of 49′ cables with active repeaters solved the issues. 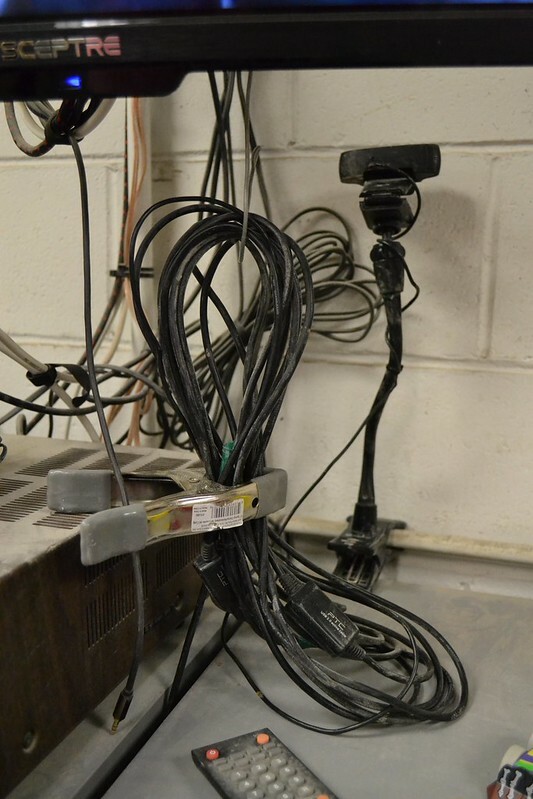 These are run behind equipment and taped to the floor where needed, then bundled up next to the camera to allow for a range of 30′ from the cable anchorpoint. I also ran a sixth one of these for my dedicated microphone. 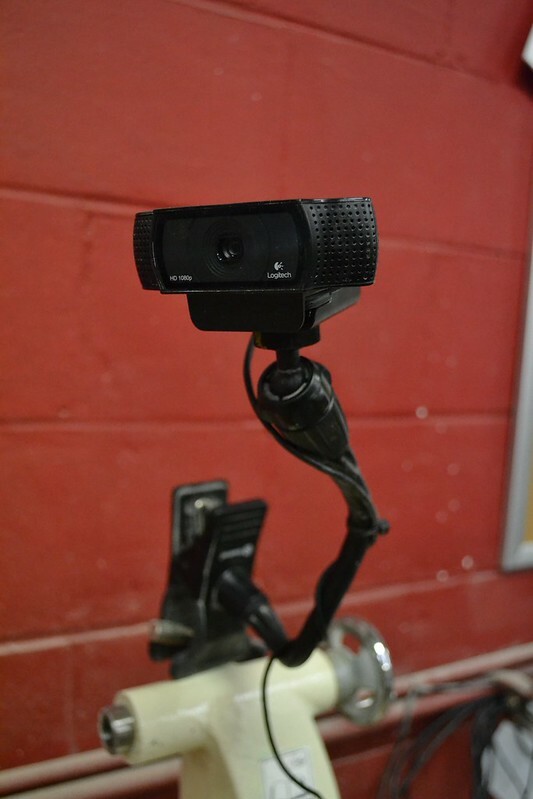 The webcams themselves weren’t a huge deviation from the streaming community standard. I use four Logitech C920 cameras and one Logitech C270. The 270 lives in my spraybooth and was chosen because it would be very inexpensive to replace once covered in paint. Some experimentation was done with Playstation Eye cameras (garbage video quality) as well as a Microsoft LifeCam (requires cumbersome drivers and crashed OBS constantly, despite having beautiful resolution) but in the end, the Logitech units are reliable workhorses. There are some issues with white balance and auto focus from time to time, but they just plain work. 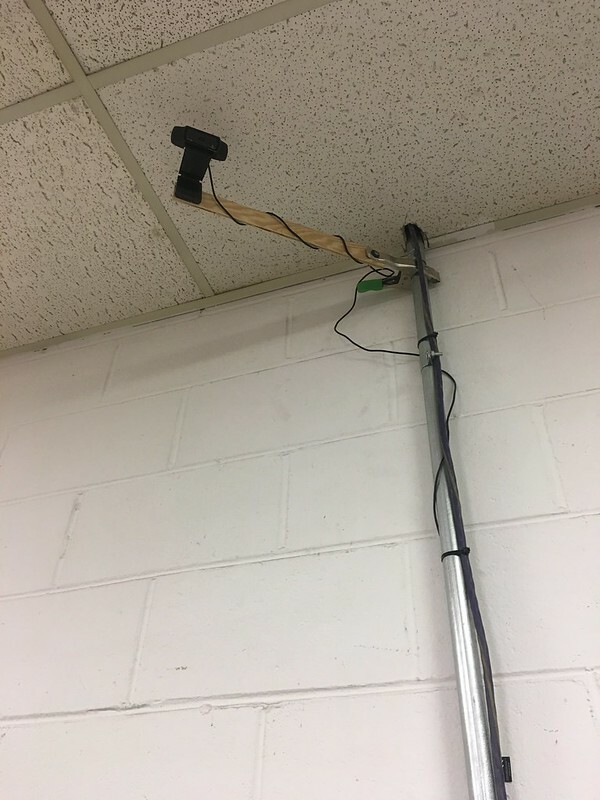 Below is “Eaglecam” a C920 mounted near my ceiling that gives an overview of the shop. You can buy 1/4-20 mounting nuts to make pretty much anything into a camera mount, as shown with the scrap of wood and spring clip here. 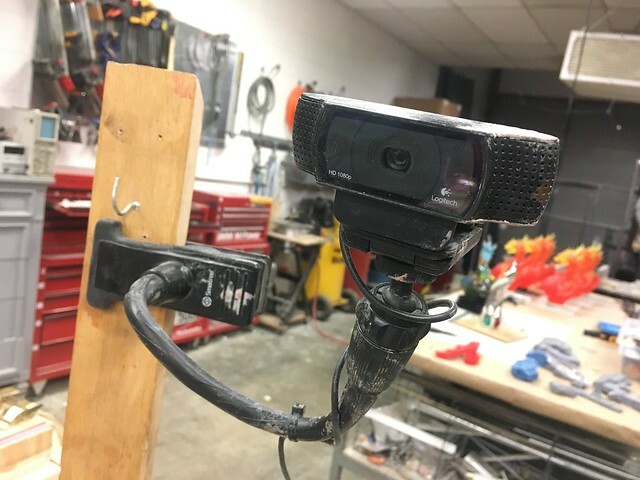 Of course, Webcams aren’t really meant to be used in this manner and don’t come with any mounting hardware suitable for a workshop. The C920’s have a convenient 1/4-20 threaded insert in their base which makes it possible to mount them to a tripod shoe or pretty much any other standard camera accessory. 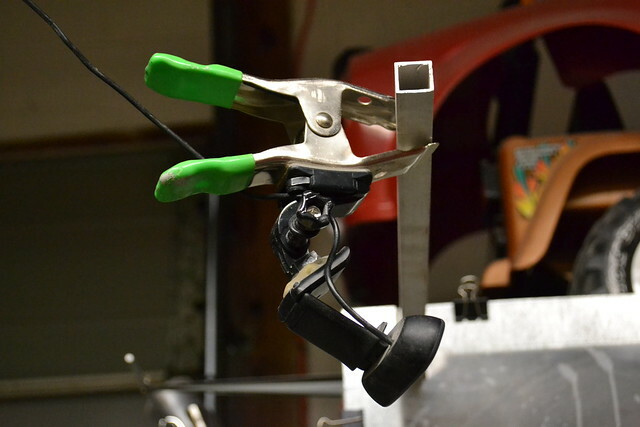 I picked up a couple of these mounts – flexible shafts mounted to a clip base – which allows me to reposition them anywhere around my shop easily. Side Note: look at how crusty this C920 is already! This is why I’m not running pricey digital video cameras in the shop. The C270 didn’t have this option, so it was epoxied to a GoPro base. There are a ton of accessories for these out there, which makes it easy to reposition the camera onto one of the flexible stands or a tripod as needed. For ease of repositioning, I also picked up a couple of photography light stands. These have a smaller footprint than a tripod and extend/collapse with only one wingnut, so they’re simple to adjust on the fly. 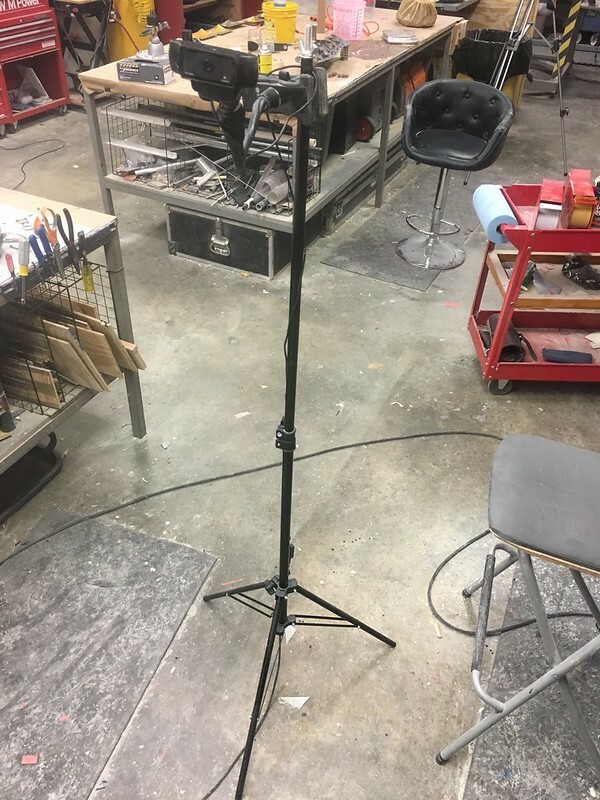 They’re also way cheaper than tripods. One of the above clips secured to these can extend to over 8′ high for some great overhead shots. If you run audio through these webcams, that will take up additional USB resources and lead to – you guessed it – more crashing. For a while I turned off all camera microphones but one and used that as my main audio pick up, but that method was poor quality at best and often resulted in echoing. 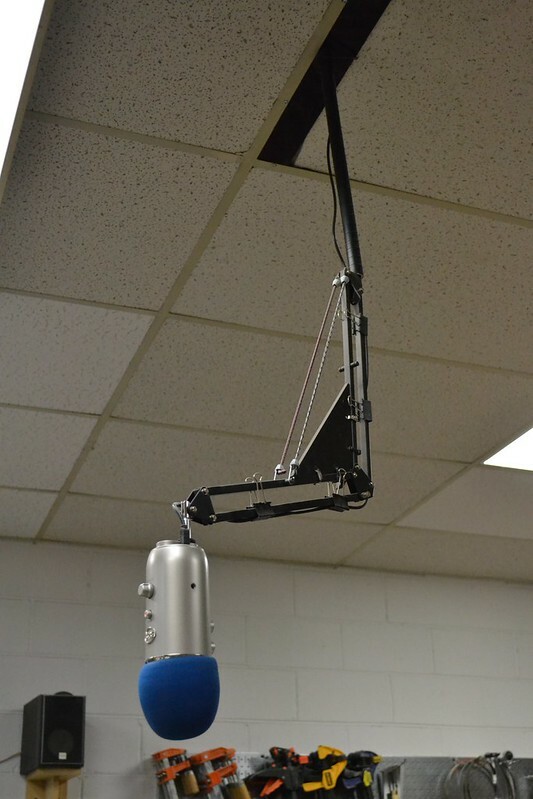 Eventually I picked up a Blue Yeti microphone and mounted it inverted from my ceiling. This sits on a swivel mount and it set up for semi-omnidirectional input. I can easily turn it to wherever I am in my studio and the sound comes in crisp and clear. The mount needs to be revised, but that’s a project for another time. I also picked up a pop guard, though this is mostly to keep dust out of the microphone than to filter out sharp audio inputs. If you’re working in a shop, you’re going to be getting dirty and dusty, so buy a second mouse to navigate your computer that you don’t care about mucking up. The one in the photo actually died fairly recently, but my new one is going strong. Grab something in a bright color so it doesn’t get lost amongst the shop flotsam. 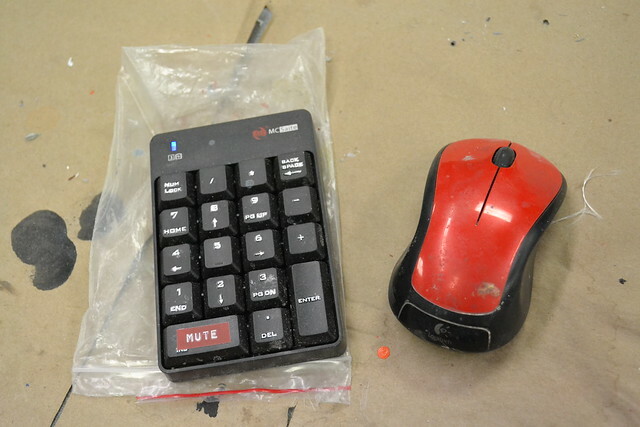 The wireless USB number pad is used as a video switcher; it lives inside that little plastic bag to keep from getting destroyed by clay and resin. Gameshow allows a set of hotkeys to be used for switching between scenes. This requires a bit of pre-planning when setting up your layers, but makes swapping video inputs quick and easy once organized. I have my 5 cameras set to keys 1-5, then various multi-camera arrangements set up on 6-9 as well as the +, -, / and * keys. While OBS allows for global control on hotkeys, switching scenes when a key is pressed regardless of what program is in use, Gameshow will only swap scenes after hitting a hotkey and pressing “enter” while Gameshow is the active window. This can get a little annoying at times, but it’s a fine trade for the reliability. Lastly, in order to see everything that’s going on, I have a 40″ TV purchased from WalMart’s Cyber Monday sale three years ago mounted to one wall of my studio. 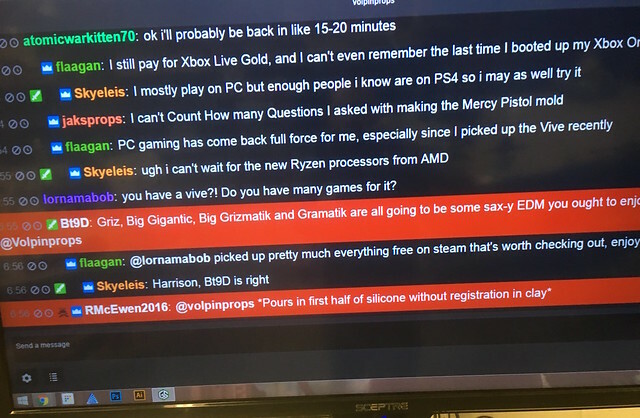 I run Twitch chat fullscreen here so I can see what’s going on from anywhere in the shop. Despite living in a shop environment for three years and being on for 8+ hours a day every day, this thing is still going strong. So that’s the whole set up! Gameshow, a handful of Logitech webcams, the meanest USB card you can find, repeater cables, clip-on camera mounts and some disposable control devices. I’d estimate the entire set up has run me around $800 or so, not bad when spread out over several months of troubleshooting and the fact that I have five video input sources. Huge shout out and thank you to the people over on my Patreon – I wouldn’t have been able to do all this without your support! Come hang out over on Twitch if you want to see all this in action. Hope this helps my fellow creative streamers!